Hi everyone! I have really missed blogging for the past two weeks. It is such a release for me and it is icing on the cake that I have such great readers who are interested in my ramblings. Thanks for making the last half of 2010 really special and I am looking forward to some exciting ideas I have in store for you in 2011, such as….. Giveaways!!! I am working on some fun giveaways for my loyal readers from some great crafters at Etsy! An online swap meet This might seem better on paper than it is in real life but hang in there with me and it might just be fun. Might. Guest posts I had really good responses from my readers about the great Favorite Things posts from my dear friends so be on the lookout for more guest posting and maybe even some celebrity guest posting. Q and A segments where you can email me questions about anything from organizing your junk drawer to how to lose those last ten baby pounds to how to find the best deals on bath soap. Design help, where you email a picture of a room you are struggling with and we work together to make the room work for you. Also, getting help from fellow blogger/Facebook friends about design questions as well. Plus lots of other fun things for 2011 to get us through the blahs of winter. So hang in there with me because this is the coolest place to be! I am not a fan of January. Or even March for that matter. Basically, I do not like winter. But I have two really good reasons to look forward to winter and they are 1) Annie and 2) Ellie. My oldest daughter’s birthday is in March and my youngest daughter’s birthday is in January. (Made for some really wonderful postpartum when it got dark at 4) But I really look forward to their birthday’s since winter can be so, well, for lack of a better word, icky. Ellie’s big day is the week after the new year so it gives me the motivation to get the Christmas taken down and freshen up for the new year. 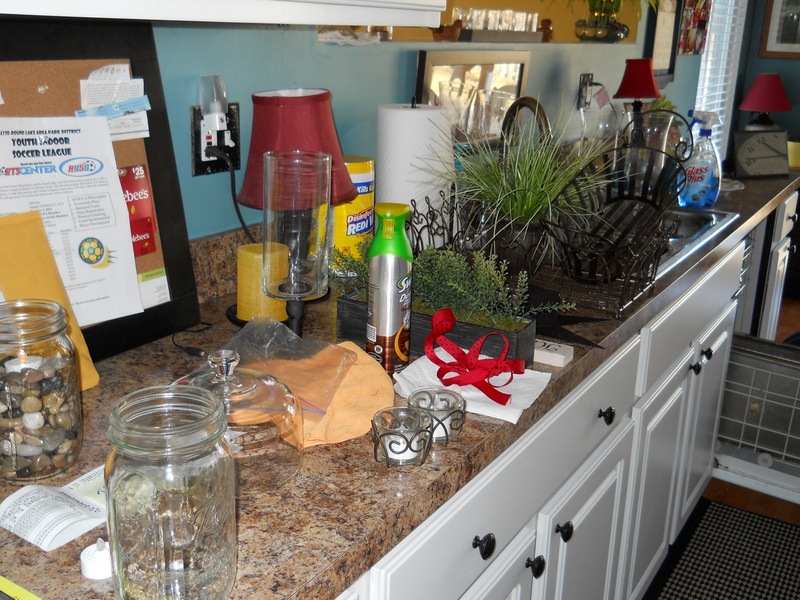 This was my kitchen counter three hours ago. 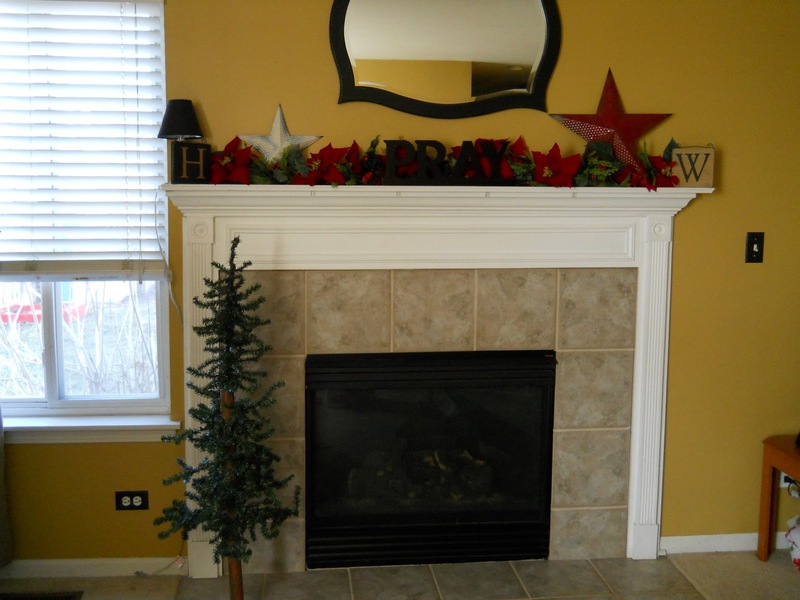 Taking down Christmas is just as depressing as it looks. 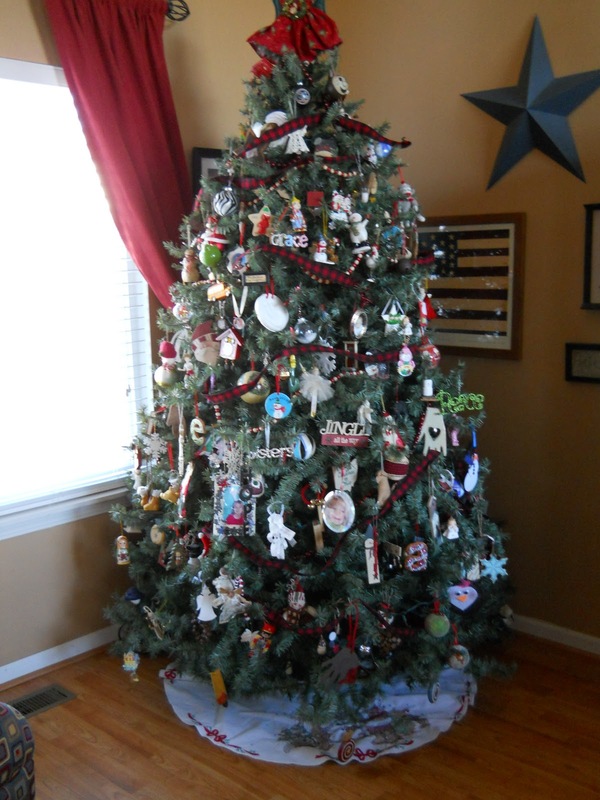 One thing I do is listen to Christmas music while taking it down. It just makes it less depressing for me plus it is one more excuse to listen to Andy Williams. Speaking of after Christmas, there are some great deals to be had at the stores right now on Christmas merchandise. Kohl’s has 75% off but their stuff is overpriced, to begin with so the deals are not really great yet. I mean $3.50 for an ornament? That’s crazy talk. These are a set of 4 silver chargers. Do you know what a charger is? There are many people who don’t but since my friend and I attended the “Pottery Barn decor class” in November, I feel I am educated enough to spread the word. You put these silly little things under your regular dinner plates to make the plates” pop” so that your dinner table looks pretty. Well, PB also sells these lovely items for a whopping $16.00 a pop. Yes, each. $1.25 for a set of four. That comes down to approximately .31 cents a charger. Mine are not ceramic like PB’s, they are plastic but come on, who even cares? 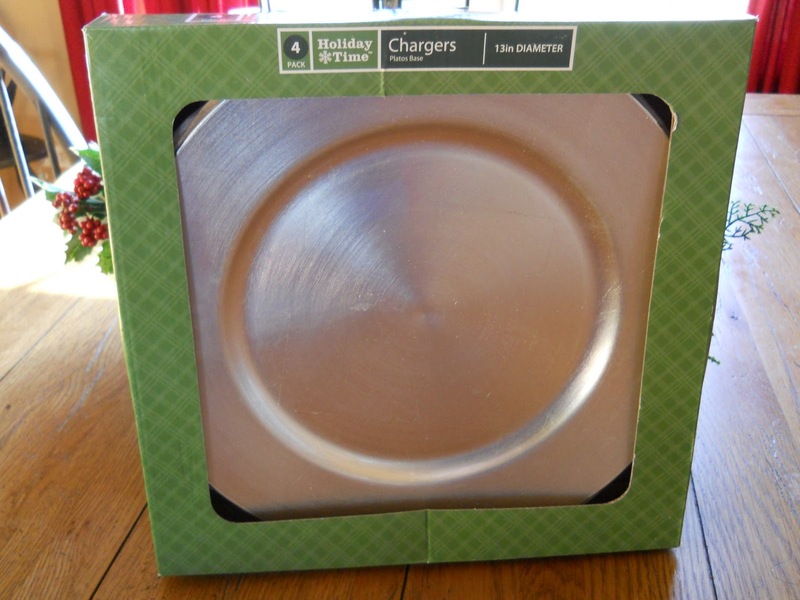 I have kids so why on earth would I want a breakable charger in the first place is beyond me. 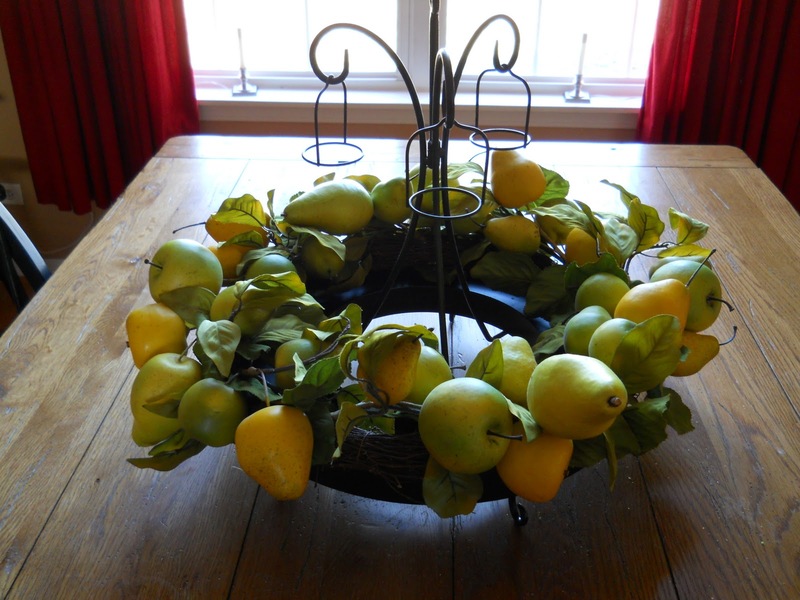 Here is my centerpiece again!! But this time I actually took the lazy route and plopped an old wreath I got at Target years ago…after Christmas, I might add…on top of it. It looks pretty good and I usually take this centerpiece down because I don’t usually have wintry things to put in it. I am not completely ready to give up Christmas just yet but I think that this can classify as more lodge/ski/wintry than Christmas. We haven’t the heart to take it down yet. Lastly, here is my cute mason jar that used to have the mints in it. 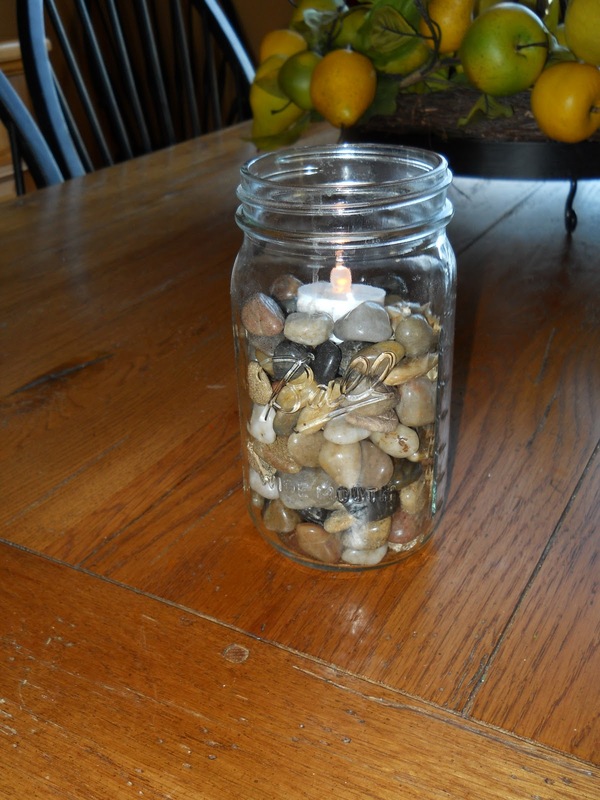 I put river rocks inside and topped it with a flameless votive. I think I may add raffia to the rim to make it look more finished. Happy 2011 to my followers and fellow bloggers!